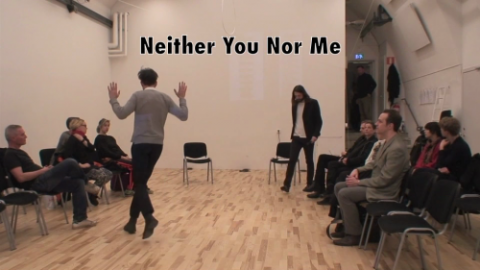 This year Anders M and Anders P start the project “Neither You Nor Me”, a cross-over platform using the theatre practice as venue for meetings between artists and researchers from different fields. For 25 years they have been working together, one as actor and the other as director. In “Neither You Nor Me” they will together enter a journey through the narratives of Sophocle’s “Antigone”, Eschenbach’s “Parzival” and Melville’s “Bartleby”. The first material presents a number of dialectic positions – man/woman, king/citizen, law/religion – and the second is an invitation to follow the movement from singularity to subjectivity. The third story investigates the potential of doing nothing at all. Together they form the foundation for a serie of examinations of the stage as a venue for, and encounters between, equal subjectivities; an arena for production of difference rather than identity, where participants and audience together can build imaginations of the infinite amount of potential existences, lives and destinies that isn’t our own. The basic idea is simple: two individuals with identical references – age, background, gender, field – meet each other on stage in the act of storytelling; in acceptance and appreciation of the fact that we never will be able to share each others perspectives, or create an identity between them. 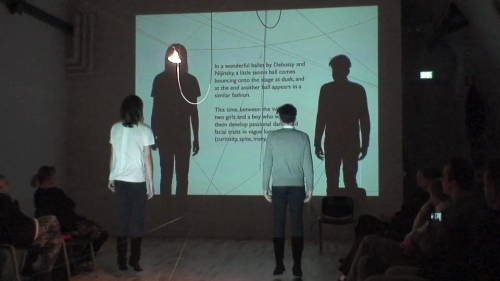 Our verbal storytelling is projected through the perspectives of our bodies in the space, together with analogue animations produced with two overhead projectors, where we in a very simple, concrete fashion look at the basic notions of the narratives with the audience. The staged body here, rather than being the representation of a certain identity, is trying out positions and perspectives, supporting the imagining act of the audience. The story is given the function of an interface, the membrane that both separates and connects the individuals reading/interpreting it. In the same way, we contextualize the face as an interface; defining both the outside and the inside, the surface that activates a machine producing communication and exchange of meaning, rather than communicating a finalized meaning in itself. The objective of the project is to examine an updated toolbox for theatre. By merging methods and strategies from different art disciplines we aim to develope alternatives to traditional methods based on identity and mimesis, focusing on listening rather than understanding, and thus more suited to meet the needs of a postnational world. Non-plan enterprise zones, propagative-atmospheric-urbanism and dark matter organization are examples of contemporary strategies that are used to transform the city and its architectures. The practice of building has become so abstract, so hi-jacked by the forces of economics that when we talk about building cities, we are no longer talking about actually building matter, but optimising systems to better insure continued growth. The qualities of the cities of the future have nothing to do with the needs of the current citizens; instead it is geared toward attracting a future workforce of ambitious, well-educated and creative young professionals. The urban industry complex is preparing us for a city where life and work are again merged as one. A city where attention is the new currency and every interaction, encounter or experience is understood as an economical transaction. What role will architecture and architectural processes play under these conditions, is it doomed to act as a lubricant for an increased privatization or could it re-form itself as an oblique order, a refused flank, for the construction of a different collective? Created & performed by: Anders Paulin and Anders Mossling. Guest: Tor Lindstrand. 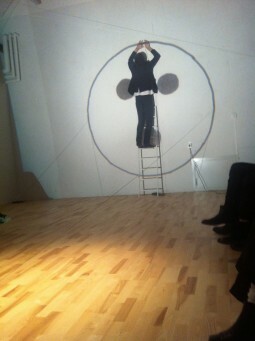 Co-production: MDT, Black Box, Caféteatret.